MOSCOW, March 11 (Sputnik) — The Organization for Security and Co-operation in Europe's (OSCE) Special Monitoring Mission (SMM) records the withdrawal process of heavy weapons in east Ukraine instead of their absence in the security zone, Vladislav Deinego, the self-proclaimed Luhansk People's Republic (LPR) negotiator said Wednesday. "SMM OSCE indirectly confirms the withdrawal of heavy weapons process, but not the fact of its completion. The point of the Minsk agreement is in creating a security zone free of heavy weapons, not in demonstrating the process of withdrawal," Deinego said in an interview with the Luhansk Information Center. The 13-point agreement hammered out in the Belarusian capital on February 12, also envisions a region-wide ceasefire, in effect since February 15, and an all-for-all prisoner exchange between Kiev and the east Ukrainian independence militia under OSCE supervision. "Unfortunately, SMM OSCE says not a word in confirmation of the absence of heavy weapons in areas, from where the parties agreed to remove [heavy weapons] as planned," Deinego added. 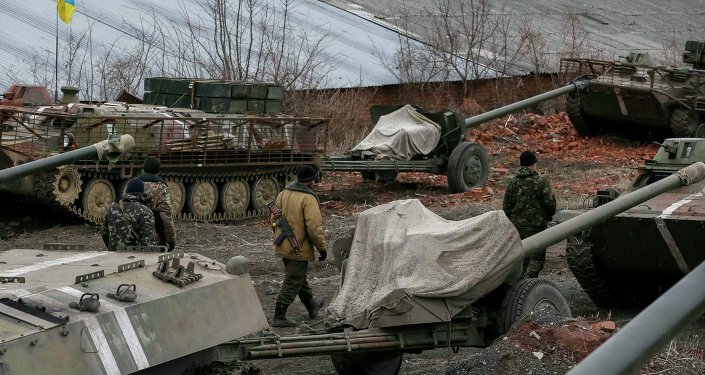 As part of the Minsk deal, the sides were to withdraw artillery starting at 100 mm, multiple rocket launchers and tactical missile systems at distances ranging from 50 to 70 and 140 kilometers (31, 43 and 87 miles respectively). These buffers are intended to be part of newly established security zones. On Tuesday, Ukraine's special operations spokesman Anatoliy Stelmakh announced a complete withdrawal of heavy artillery from the contact line in southeast Ukraine. The spokesman's announcement followed the head of special operations Andriy Lysenko's statements that Kiev refuses to pull back large-caliber arms entirely until independence forces' heavy weapons withdrawal is confirmed. Deinego noted that such contradictory statements carry the risk of disrupting the implementation of the Minsk deal. Luhansk, along with neighboring Donetsk, stated their portion of the heavy arms withdrawal was complete by March 1, meeting the two-week deadline outlined in the Minsk deal. The Organization for Security and Co-operation in Europe, tasked with monitoring the implementation of the Minsk agreement, has not fully confirmed the pullback and requested more detailed information from both government and independence forces. The conflict in southeastern Ukraine began in April 2014, when Kiev launched a military campaign against independence supporters in the eastern regions of Donetsk and Luhansk. OSCE observers have been deployed in the region since then, monitoring the situation and publishing daily reports. The United Nations estimates that over 6,000 people have died in ongoing battles.